Parents are always willing to shower more love than what their children can reciprocate, and giving khaao niaow (sticky rice) is one of the myriad ways Mr. P’s parents show their concern. Before our recent trip back to Mr. P’s hometown in Udon Thani, we asked the parents to source some sticky rice grains for us, suggesting that about one kilogram would do, but instead they prepared a 10-kilogram sack for us. We had to insist on leaving half the grains with them because 10 kilograms would probably take us more than a year to finish since we don’t eat sticky rice for every meal. 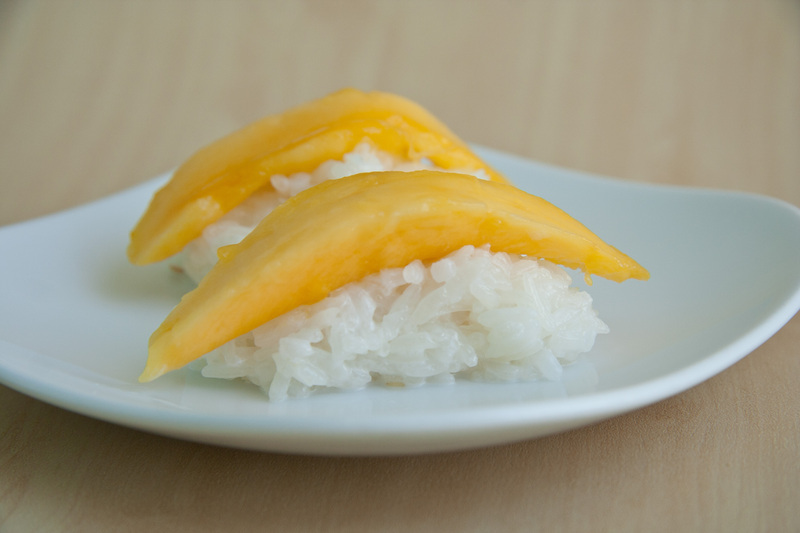 But if mangoes are like wives to sticky rice for desserts, then durians must be the mistresses. As it all boils down to preferences, some would say mistresses are better than wives durians complement sticky rice better. 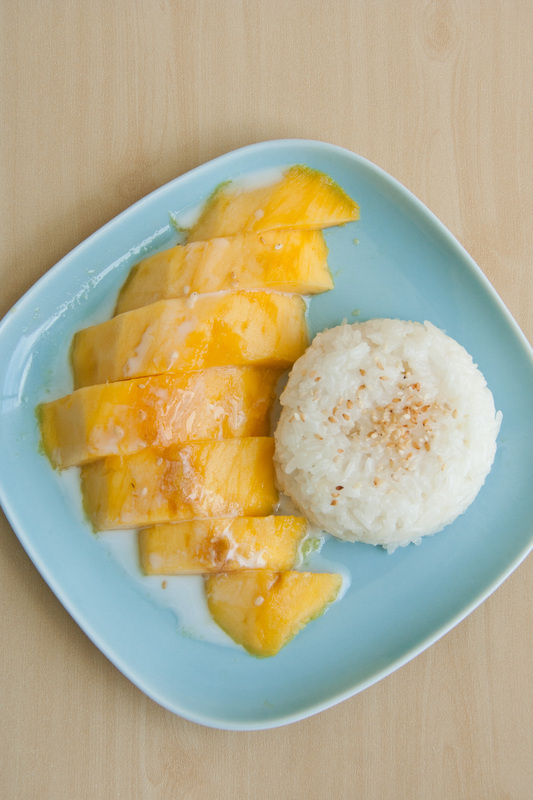 I like both versions, but sticky rice, coconut milk and durian make quite a ‘heaty’ and calorie-laden combination, so it’s best not to indulge in this trio together too often. And here I’d like to share an anecdote in which yours truly showed her silliness. One day, just hours before I was supposed to board my flight to Singapore, I traipsed to my neighbhourhood fruit stall with the intention to buy some mangoes. I reached the store and saw a batch of mangoes wrapped in foam netting neatly placed together. Holding up one yellow fruit, I pulled away its wrapping slightly. “These mangoes look a bit different, without the usual pointy end,” I thought to myself. “Hmm, maybe they aren’t the naam dorkmai varieties. But beggars can’t be choosers. I don’t have time to hunt for mangoes to bring with me to Singapore to make khaao niao mamuang for the folks.” And so I bought two mangoes. “So that’s why!” I thought to myself, abandoning all thoughts of taking the 1.5-kilogramme load with me to Singapore. 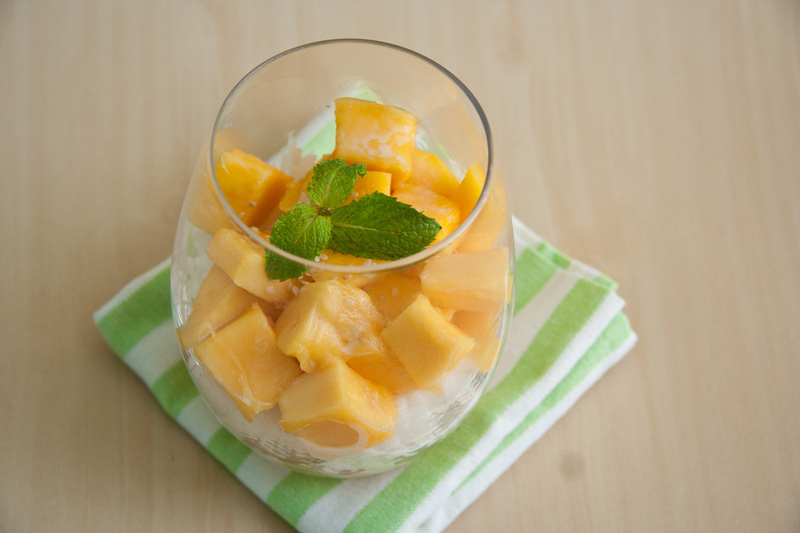 After all, YC told me that Taiwanese mangoes were available in supermarkets in Singapore, so I could also use other cultivars to make the dessert for my folks. Hence, I left the mangoes at home for Mr. P to eat while I was away. Later that evening when Mr. P got home and I was already at the airport to catch my flight, he sent me a photo of the sliced mangoes. The flesh was a deep orange and a core filled with round black seeds covered with a jelly-like coating, so my mangoes were actually papayas. Doh! 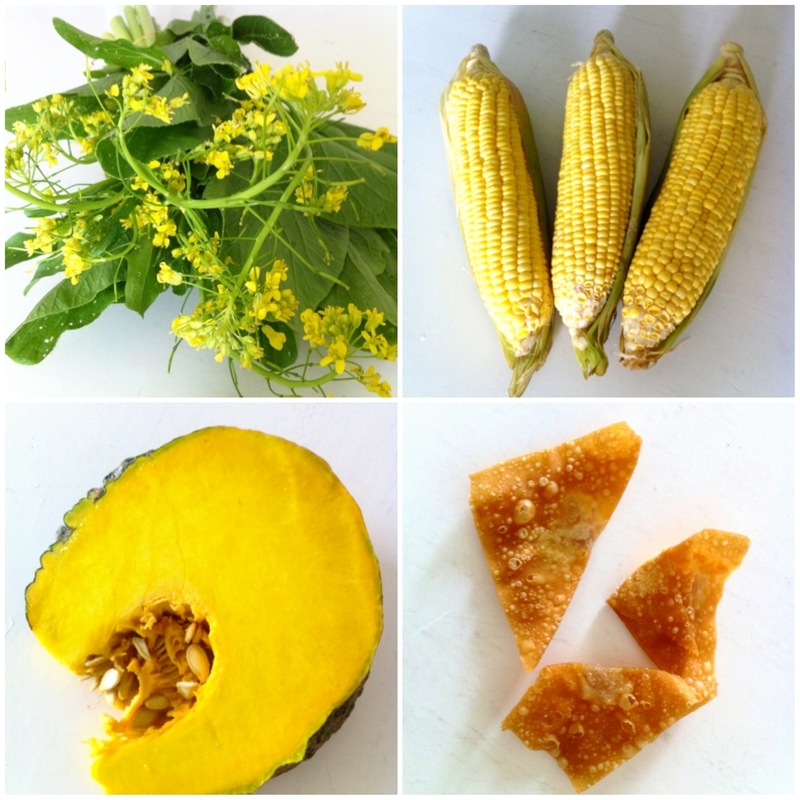 On a less silly note, the recent interest in mangoes has added to my experience in the kitchen too. Mr. P showed me the proper way to de-skin and slice a mango. “Use common sense and experience to guide yourself. Don’t believe the instructions others dispense on their blogs!” he remarked. So there you go, read everything (including this blog) with a pinch of salt and endeavour to try everything on your own. [Brief instructions on how to slice a mango] 1. With the mango firmly in your hand, peel the skin off the top cheek. 2. Make lengthwise (or criss-cross) cuts of about one inch thick, then insert the knife from the side and slice around the stone in the middle. 3. Flip the remaining mango around; repeat steps 1 and 2. 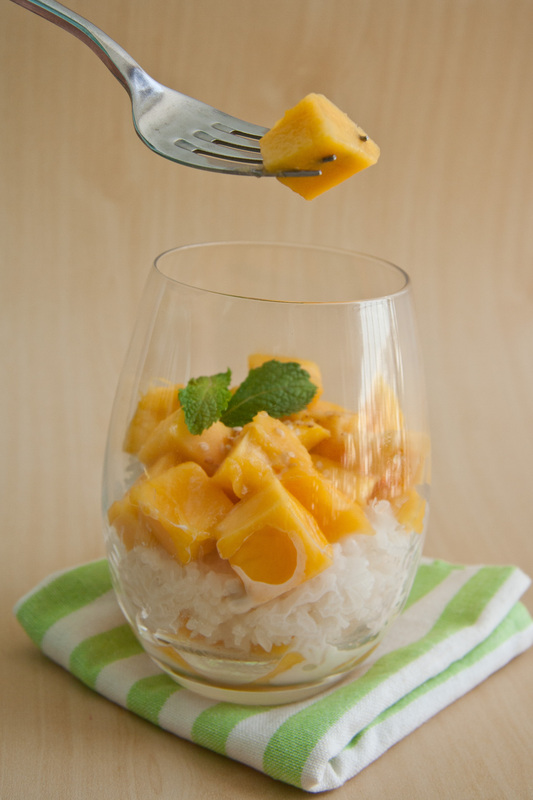 For the best effect, chill mangoes after cutting, only taking them out of the fridge when you’re ready to serve with sticky rice. Heavenly! Off to the market I went today, and I came home with various shades of yellow. The phak kwaang tung were singing to me again; the corns are joining the cabbages and carrots for tomorrow’s soup; Thai market vendors sell pumpkins according to the weight requested; and fried wontons make good company with clear tom yam soup. Hoi laai phat naam phrik phao (หอยลายผัดน้ำพริกเผา), or stir-fried clams with Thai roasted chilli paste, is a very common dish at khaao kaeng (mixed dishes) stalls in Thailand, but the serving size is typically quite small for my liking. 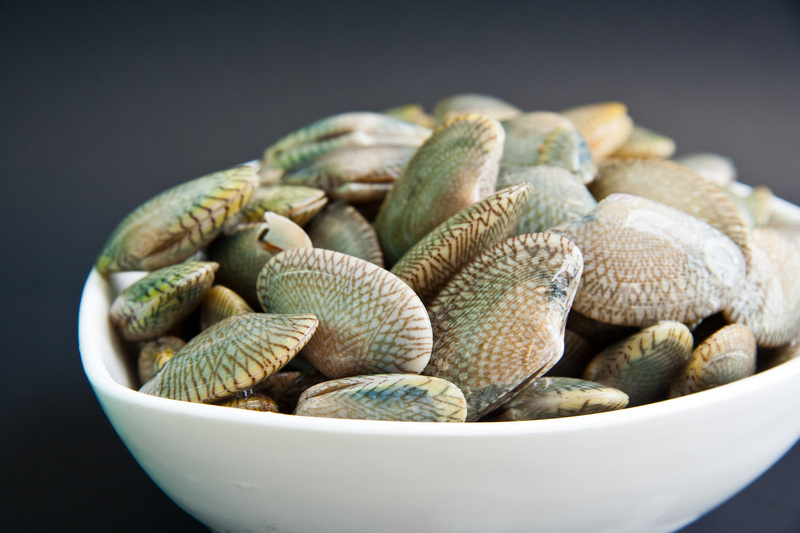 When a seller scoops up a serving of the stir-fried clams onto a plate of rice, more often than not there will be at least one empty shell lurking among them, so actually you’re just getting more shell than meat. But of course, the essence of this dish also lies in its flavourful sauce; some people like to spoon steamed rice mixed with the briny juices. Mr. P and I think that eating this dish particular outside home offers less value for money as compared with other dishes, but things are very different if you buy fresh baby clams and cook them on your own though. One kilogram of baby clams—it cost us about 70 baht from the fresh market—is more than enough to satiate two gluttons like us. I love looking at these lovely clams. It looks like Mother Nature has taken the time to paint criss-crossing lines on each single shell, so much so that in Thai they are known as hoi laai, or patterned shells. While cooking this dish requires very simple steps, preparation needs to start a bit earlier. Being the seabed-dwelling creatures they once were, these clams carry with them more than just a whiff of the ocean, so I usually soak the mollusc in water for at least an hour before cooking to ‘force’ them to spit out sand and gritty bits. 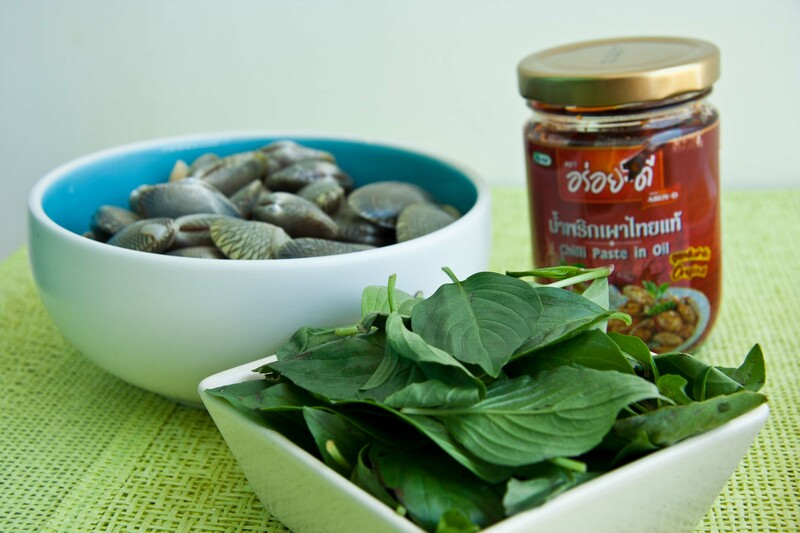 Besides baby clams, to cook this Thai dish, other must-haves are roasted chilli paste (naam phrik phao) and sweet basil leaves (bai horapa). Together, these holy trio makes the most alluring combination—now who says three’s a company?—that my favourite naam phrik phao brand, Aroi-D, features the dish on its packaging (see above). Once the stove is heated up, I look forward to stirring the clams in the skillet. As they bump into one another in the pan, they give out ‘kraek kraek’ sounds, and that’s when I’d conjure up images of a future pet dog at my feet, equally stirred by the smells and sounds from the wok. 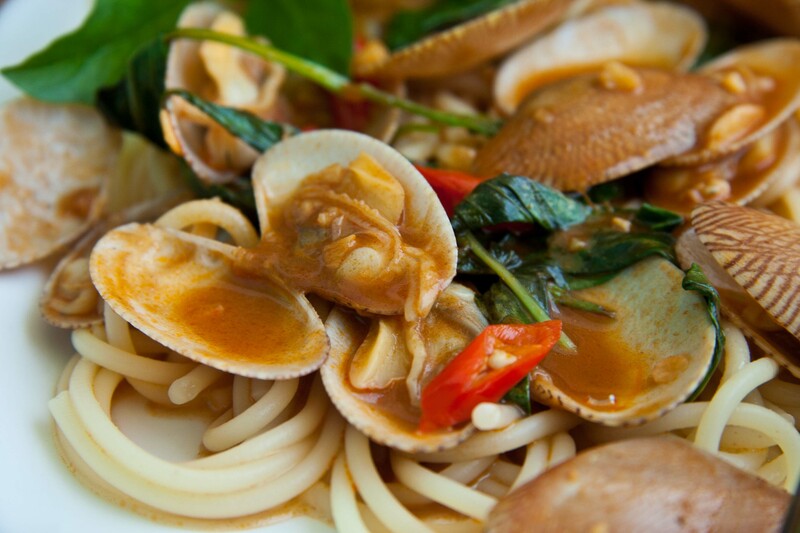 After a few minutes, the heat would have left its mark on the ingredients: not only would the basil leaves have released their fragrance, the clams would have opened up to reveal their inner goodness while their previously grey colouration with tinges of blue and greens would have given way to an irresistible shade of orange. Interestingly, this Thai dish also makes good company with spaghetti, giving me one more way to cook pasta. I got the inspiration when I visited a local Italian-Thai restaurant serving fusion food, with spaghetti stir-fried with clams as one of its signature dishes. 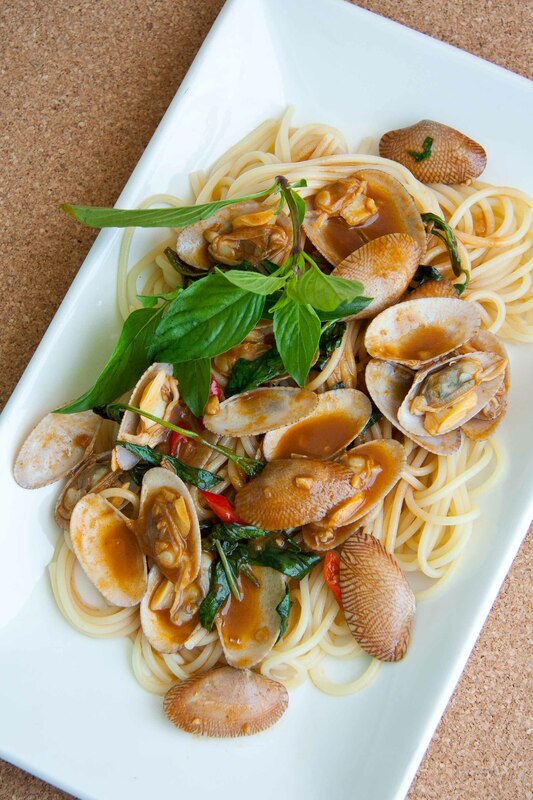 Simply prepare spaghetti as per your usual method before topping the plate with the stir-fried shells. To me, the sauces seeping through the spaghetti strands, juices sitting on the opened shells, garlic bits and stir-fried basil leaves all come together to make a very pleasing and appetising sight. 1. 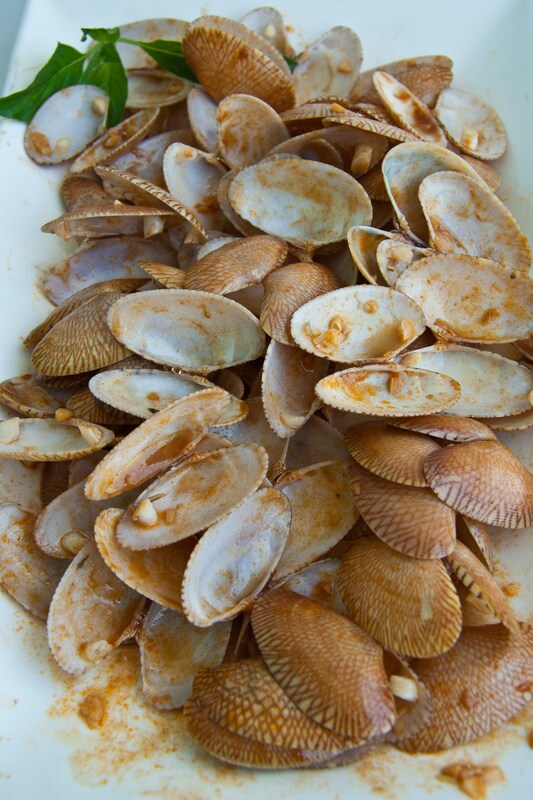 Soak the clams in water for at least 30 minutes, then wash the shells under running water, giving them a quick rub at the same time and discarding any with mud inside. Pluck the basil leaves off the stems, rinse them and set aside. 2. Pour oil onto a heated wok or skillet before adding the garlic. Fry the garlic until it turns a light golden. Add in the clams and stir-fry them for a few minutes. Once the clams start to open up, add Thai chilli paste and chillies, making sure the paste is evenly coated throughout the mixture. Give the sauce a quick taste, adding fish sauce if needed. 3. Finally, add in the basil leaves and stir-fry the mixture for about a minute of so. Turn off the heat. 4. Discard any unopened shell. Spoon the mixture onto steamed rice or cooked spaghetti. Serve.